Fun fact about Montpelier: it is the smallest capital city in the Union (some 2,000 souls). 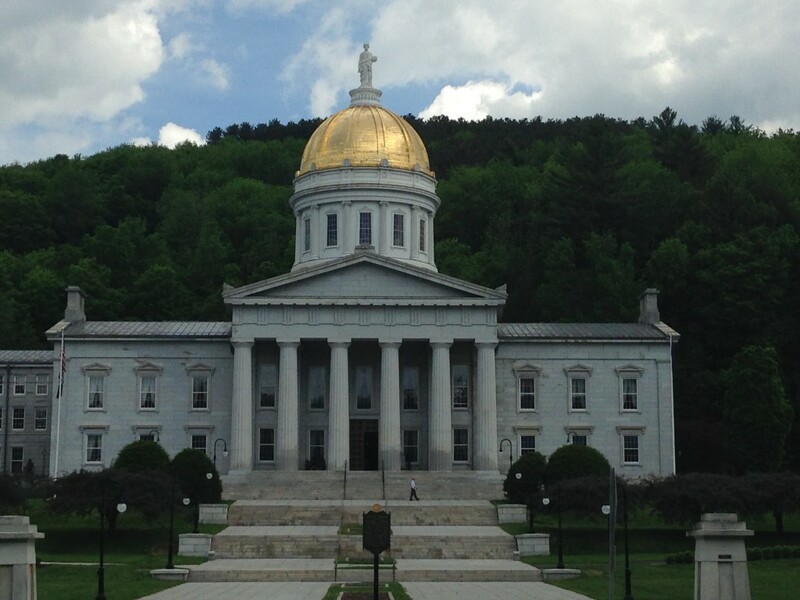 The Vermont State House, the third one on the site, was constructed in the 1850s. We admired the portraits of Calvin Coolidge and Howard Dean. 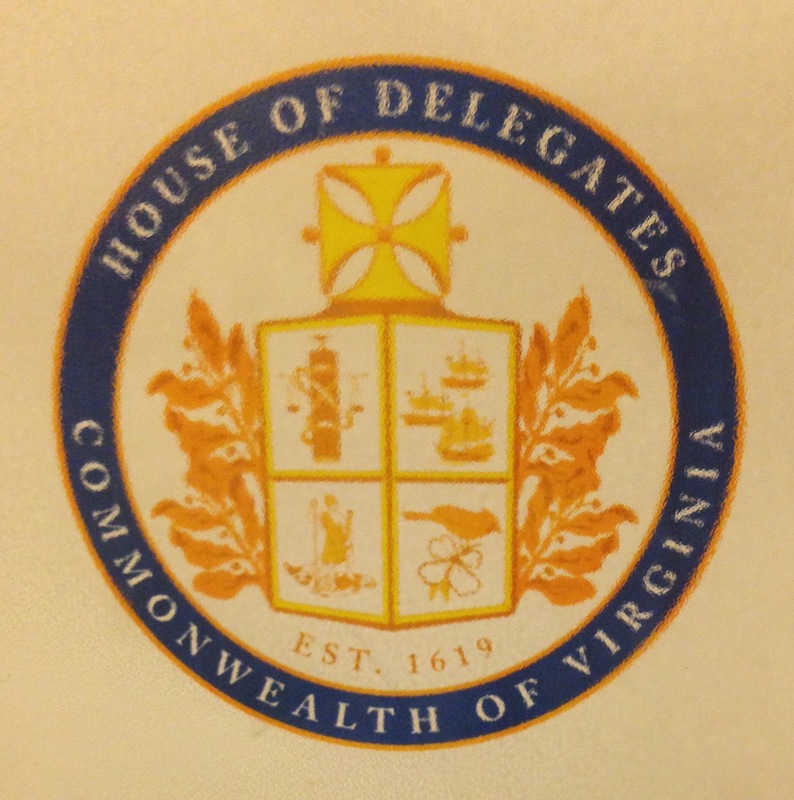 The legislature was in session when we visited, so we got to do some lobbying. 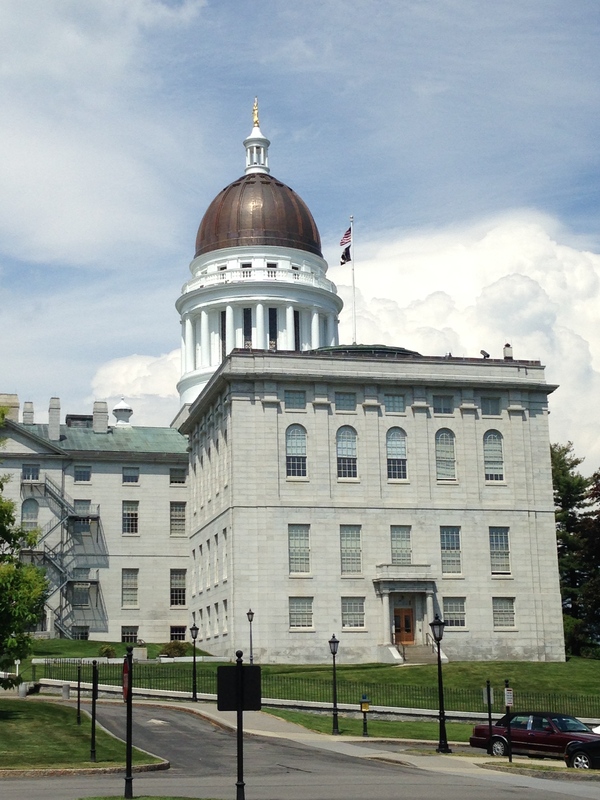 It was built in the 1830s, following Maine’s secession from Massachusetts in 1820. There was a great State Museum nearby. We quite enjoyed all the nineteenth-century industrial cloth-production machines they had on display (really!). This was the best picture I took on a rather cloudy day; unfortunately it doesn’t convey the full extent of the building. This capitol is probably the most historically significant of the three we saw; it was designed by “Mr. Jefferson” (as they kept calling him), and served as the capitol of the Confederate States of America after Virginia seceded from the Union in April, 1861. 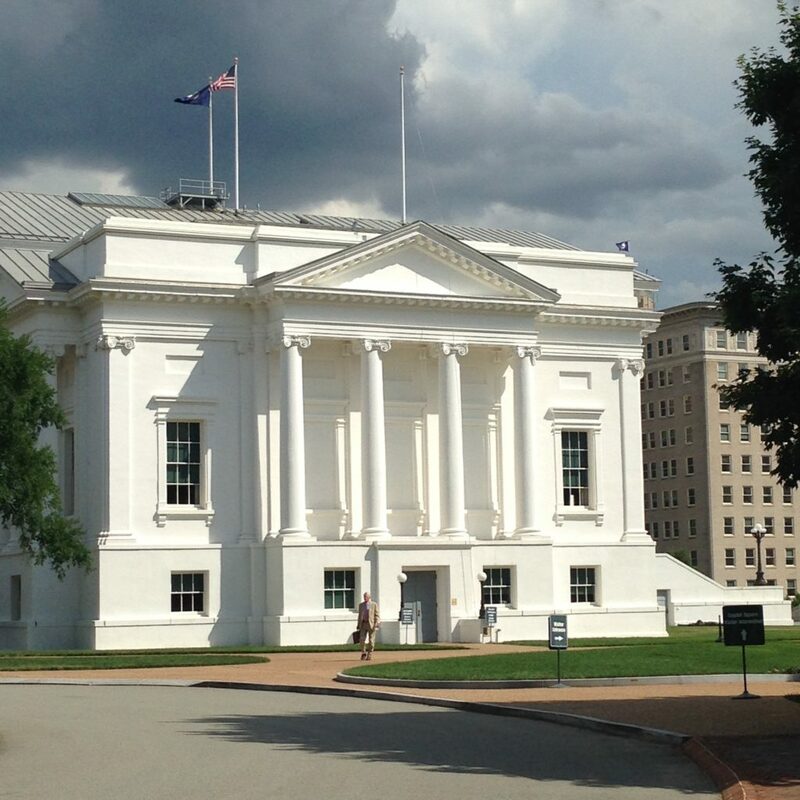 The original building is essentially the Maison Carée in Nîmes, and in 1904 wings were added for the enlarged House of Delegates and Senate (pictured is the wing on the northern/western side, for the Senate). Speaking of which, I had forgotten that the Virginia Senate is actually armigerous! 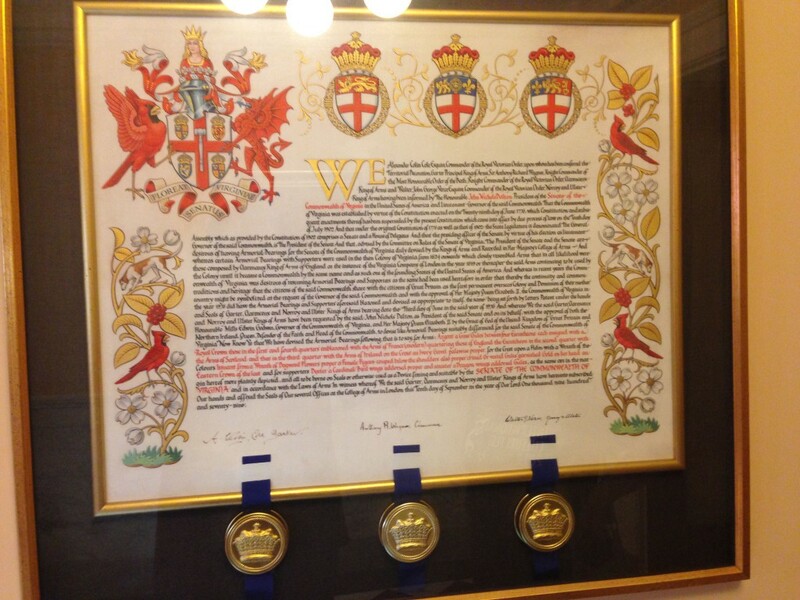 Its letters patent is on display as you walk into the chamber. 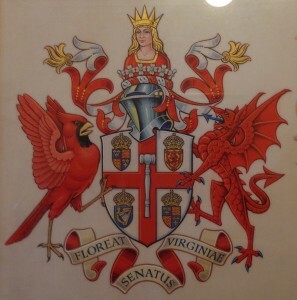 This is document represents a devisal of arms from the College of Arms in London and dates from 1979. Normally the College grants arms on behalf of the Queen, but only to her subjects; however, if you are not a subject, you can still pay the College to devise arms for you which, while not granted as such, are entered into the records and never granted (or devised) to anyone else. Thus the three coats of arms across the top, which are those of Clarenceux King of Arms, Garter King of Arms, and Norroy & Ulster King of Arms, the three executive officers of the College who are here acting on their own authority (on a proper grant, the arms across the top are those of the Earl Marshal, the Queen, and the College of Arms). From Eugene Zieber, Heraldry in America (originally published 1895). Alas, the House of Delegates is not quite as heraldically advanced! 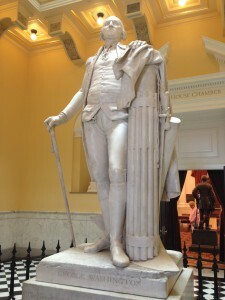 To return to the original building: the primary attraction there is the only statue that George Washington posed for during his lifetime, complete with fasces. 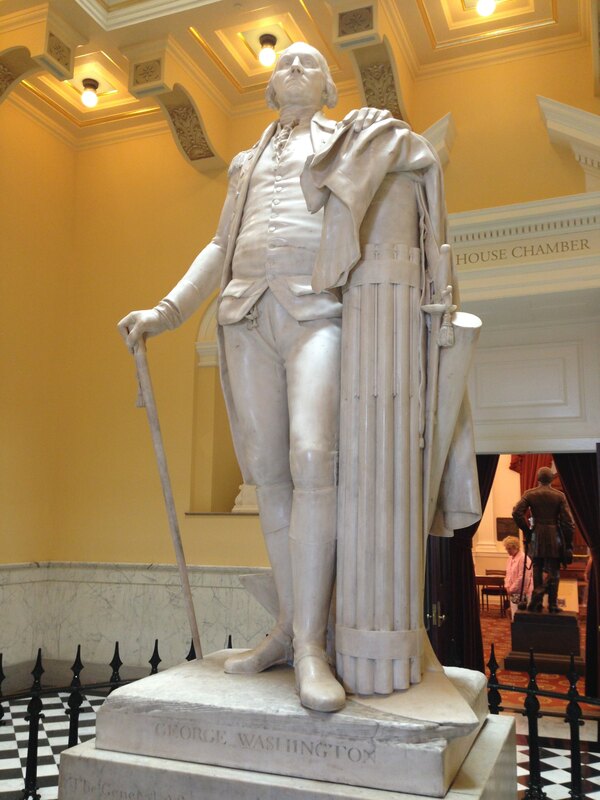 In the background, in the original House of Delegates chamber, you can see the back of a statue of Robert E. Lee, who was not a Confederate politician as such but who did hail from Virginia. 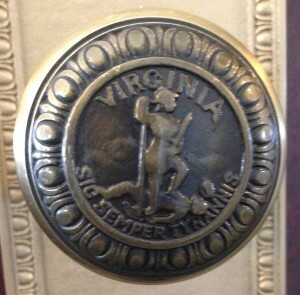 I liked their custom doorknobs, featuring the seal of the Commonwealth of Virginia, which shows, in an interesting sexual dynamic, “Virtus, the genius of the Commonwealth, dressed as an Amazon” and stepping on “Tyranny, represented by the prostrate body of a man, with his fallen crown nearby.” Thus always to tyrants! But don’t let this fool you into thinking that all Virginians hate all monarchs all the time! 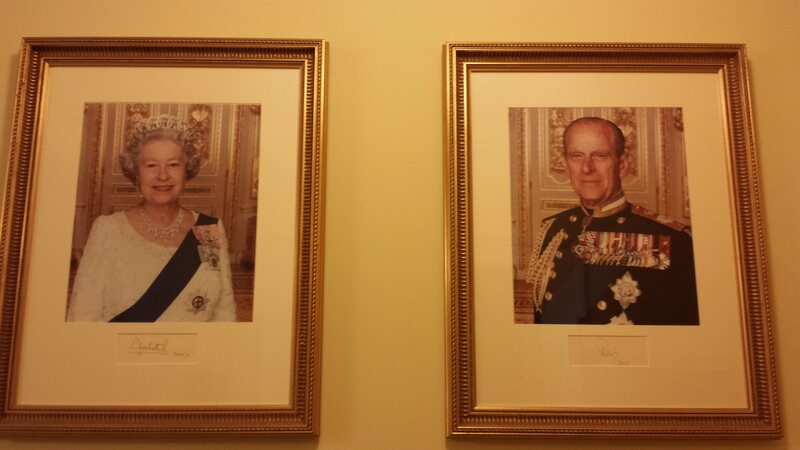 The Queen and Prince Philip came to visit in 2007; a picture records this event, and one of the guides was waxing rhapsodic about it. But, you ask, what about Mr. Jefferson? For him, we must return to the entrance. Since 2007, the tourist entrance to the State House is far away, at the base of the hill that the house is on. 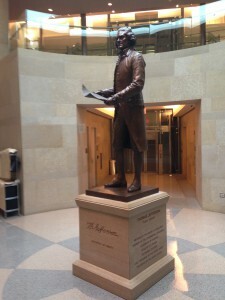 After passing security, one travels a long underground corridor housing a gift shop, a cafe, and exhibits on Virginian history, before arriving at a rotunda in honor of Jefferson, the author of the Declaration of Independence, founder of UVA, governor of Virginia, and third president of the United States. This entry was posted in Architecture, Art and Art History, Heraldry, Politics, Presidents, Royalty, Travels, United States by jgood. Bookmark the permalink.